Have you heard of EPI? It is the nation’s #1 custom school supply program. EPI supplies the Back-To-School Supply Program with thousands of schools nationwide, and provides over 1 million students, parents and teachers with school supplies each year! I found out about EPI School Supplies through my daughter’s school when they sent home a flyer about EPI school supply packs that are personalized to your child’s school and they come with all the items on your child’s back to school list. I can fully appreciate EPI School Supply Packs because I have tried shopping by myself without EPI and with EPI so I can tell you all about the difference. When I got my daughter’s kindergarten supply list, I went shopping at three different stores in order to find all the specific items the teacher had listed! This year, I got an EPI school supplies flyer from the school. 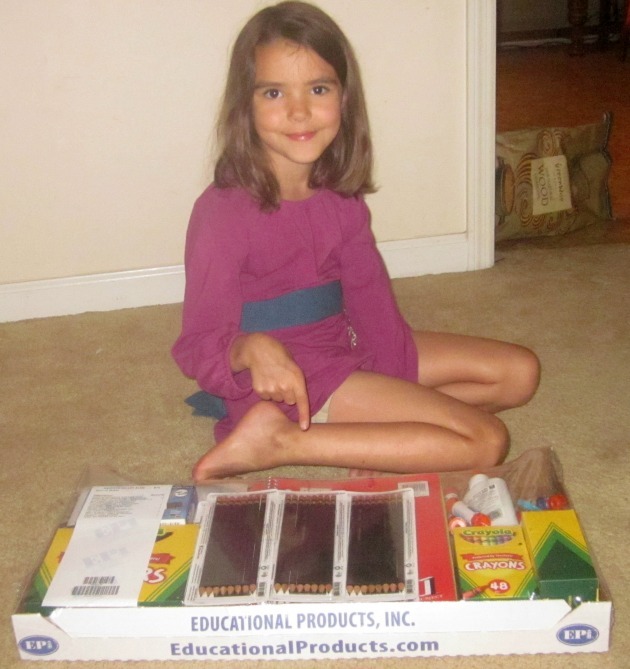 I read it and I was impressed- all her school supply needs sent to me in one package! It sounded great but I had a gift certificate to a very large online retailer and I thought I so would use it instead. I found that it was so frustrating trying to find all the right brands and size packages that I decided to save the gift card for something else and use EPI instead. With EPI school supplies, you just enter your school code and the package you need is delivered to your door. 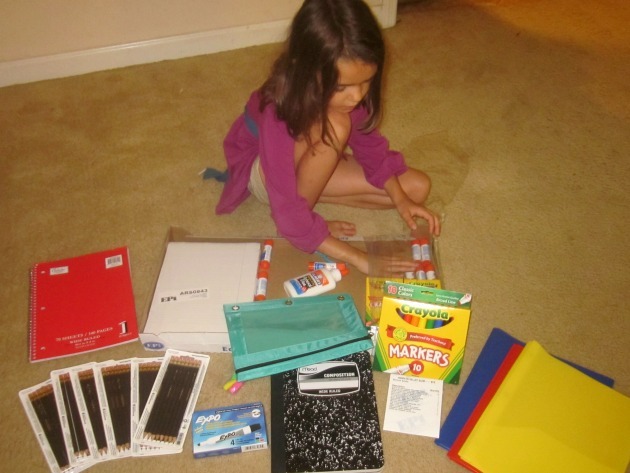 EPI makes school supply shopping so easy and takes out the last minute scramble. I give it a huge thumbs up! My daughter was excited to explore all her school supplies and I was glad knowing they were all there and just exactly what she needed. Now, I can use my time on other back to school preparation and that is a relief! EPI is a one-stop-shop for parents and educators seeking simple solutions. In addition to their school supply program, EPI offers a variety of fundraising programs, custom apparel and science fair products. The t-shirts and the ink colors come in tons of colors choices so you can customize your t-shirts just right for you! EPI even has in house graphic design artist to help you get exactly what you want on your t-shirt at no extra charge! 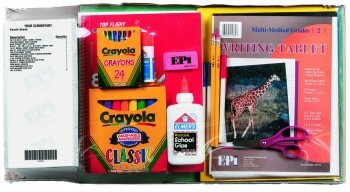 If your child’s school is not currently participating in the School Pack Program you can still order your supplies at www.episupplies.com and the supplies will ship to your home. You can use discount coupon code FFB2012 and receive free shipping on any order over $50.00. This code is active through September 15th. I received an EPI School Supply Pack in the hopes I would share my honest opinions. I received no monetary compensation and the opinions expressed are my own. like focus family blog on facebook, Justine McD…. I like their display boards. I like the liquid paints. Our daughter can use these for some of her homeschooling art projects. I “Like” Family Focus Blog on Facebook (Denise H. F. B.). I like it that with a click of a button on EPI, you can get all your back to school needs without having to fight people/traffic and spend gas $! I like the Sargent Washable Fingerpaint Set. High-Sierra “Curve” Wildflower/bouquet backpack caught my eye. I like the HIGH SIERRA “FATBOY” – BLACK backpack. I love the school packs! Back to school shopping would be so much easier! I like the 2Pks Wikki Stix. My kids love those things! I love the Crayola Dough 3Lb Bucket Blue! the paints and brushes caught my eye! I really like their prices on construction paper. I usually have to use coupons at Hobby Lobby to get my packs. This would be a great way to stock up for my girls’ group at church. Will be marking it to go back!! Their fundraising programs caught my eye. I like that EPI has student planners. They have vinyl smocks with sleeves and they’re very reasonably priced! Definitely a good thing. They carry backpacks. I like the Birds on Wire backpack. I love the School Packs – Enter your school ID and they’ll hook you up! The spiral notebooks come in many different rule sizes, which we need in my family. The crayons caught my eyes because I honestly love coloring. I like the drawing instruments(compass, protractor). They have backpacks for good prices. i am in charge of my schools science fair, and they have some cool science fair stuff. I could use the Dry Eraser White Board. I noticed that they sell glitter by the pound. I like the HIGH SIERRA “SWERVE” – NAVY/CHARCOAL/BLK. Its so hard to find the epi # 25360 books in stores so i could really use this. I am trying really hard to make my daughters first year of school a great one! She deserves it.